«Welcome bonus 2.0» - no deposit bonus program for new and registered clients! The RoboForex is glad to present «Welcome bonus», a new no deposit bonus program which can be of a great help to beginner traders, and a good opportunity to try trading using real forex accounts at RoboForex! View instructions how to get «Welcome bonus». We’d like to pay your attention to the fact that our Technical Support Service gives no answers to the questions on No Deposit Bonus, as the system operates automatically. «Welcome bonus 2.0» is $15 (1500 cents transferred to your account). It’s available for clients using Fix-Cent & Pro-Cent usd cent accounts and clients who passed the SMS verification only. Please note that «Welcome bonus 2.0» program is available for new clients only! - only metals and currency pairs are available for trading. - automatically within a day, if there are open orders. - 750 microlots (7.5 standard lots) for Pro-Cent accounts. One is allowed to withdraw profit from the bonus accounts taking into consideration onetime commission of $15 during the first withdrawal. HOWEVER, after the bonus account becomes a real one (art. 2), no onetime commission will be charged. You must use the same account details for payments each time you withdraw profit from your bonus account. In case these very account details for payments are used to withdraw profit from other bonus accounts, the company reserves the right to write the bonus off the accounts, as well as the profit gained when trading using these bonus accounts. Partners DO NOT receive commission for transactions on bonus accounts. HOWEVER, after the bonus account becomes a real one (art. 2), partners will receive commission for orders according to the normal procedure. «Welcome bonus» is credited only once for each client when (s)he opens a new trading account. In order to avoid any type of fraud involving no deposit bonus, the system that checks and transfers bonuses to our clients’ accounts is operating automatically. RoboForex reserves the right to cancel «Welcome bonus» without any explanation. Bonus can be withdrawn if the requirements of the bonus program are fulfilled. Up to the moment the requirements of the bonus program are fulfilled, only profit can be withdrawn, taking into consideration onetime commission during the first withdrawal. Example: You got 1500 cents as a bonus. If your profit after trading is 2500 cents, then, according to our conditions, you can withdraw 1000 cents, i.e. minus onetime commission of 1500 cents during the first withdrawal (next time you withdraw your profit no commission will be charged). A client can deposit bonus account with his/her own funds (in order to meet the requirements more quickly). In case of negative balance on the account, our policy is that a client loses his/her own funds in the first place. Example: You got 1500 cents as a bonus and deposited your account with your own 1000 cents. If your profit after trading is -500 cents, then, according to our conditions, you can withdraw 500 cents, i.e. your own funds minus profit. RoboForex reserves the right to cancel bonuses from the accounts without giving any reasons and/or advance notice. When registering a new account you need to choose USD currency, Pro-Cent or Fix-Cent account, select “Get Welcome Bonus 2.0?”, and agree to terms and conditions of the bonus program by selecting “I agree to terms and conditions of the Bonus Program”. Please, note, the automatic system, which checks the recurrent bonus transfer and transfers bonuses to our clients’ accounts, may deny Your attempt to register a new bonus account. In this case, You won’t be able to receive bonus from RoboForex. After registering a new account you need to pass the SMS verification in your Live Account. After the account is registered, you need to download MetaTrader 4 the trading terminal of the RoboForex and login entering the information sent to your email. 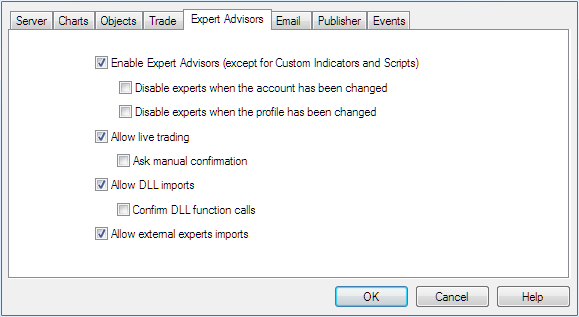 MetaTrader4 terminal menu: "Tools -> Options -> Expert Advisors"
5.After installation options for Expert Advisers (EA), you need to double-click on «verify_client» to start the script (“Navigator -> Scripts” section of the trading terminal). 7.During 1 hour system will send you message by e-mail. Find the new message «Welcome bonus 2.0 activation code» in your e-mail. Follow the link within the message. You will find your personal activation code in the your Live Account. Copy and paste code in the window of script «verify_client». After that you will be notified that «Welcome bonus» has been successfully credited to your account. 10.If you see message "You have already got welcome bonus", it means you can not get the bonus. You can use only your own funds or you can trade on demo. Please, note, if the «verify_client» script doesn’t start, it means that You don’t have access rights to the folder where the RoboForex MetaTrader4 client terminal has been installed to, "C:Program FilesMetaTrader4 - RoboForex". You need to the gain access rights or run Your personal computer as an Administrator to start MetaTrader4. creating new method and strategies given no restrictions at all. I am no longer interested in no deposit bonuses at all, I consider demo contest far better option. I am trading with OctaFX broker where they have brilliant demo contest in Southampton Supreme, it is weekly based happening every Monday, it is just 90 minutes contest yet the prizes are massive up to 1000 USD, it is really exciting to participate on here since with such contest, we improve our skill so much while also having chance to win prize. I think no deposit bonuses are look if they are from broker that’s popular and trustworthy, but this is not useful if it comes with broker that’s not reliable. I am not using no deposit bonus anymore since like Aisha said, I am also participating regularly on demo contest by OctaFX broker, it’s so good to do that because we can win so much and at present there is their latest contest Southampton Supreme going on which is weekly based with unlimited prizes.